In Mahabharata, wasn’t Drona, Karna or Aswathama capable enough to stop Abhimanyu on their own? How can a 16 year old boy cause so much fear in Kaurava army, especially when the commander in chief is Drona himself, whom even Arjuna cannot beat. Drona alone could have stopped him, what caused the situation that he was unstoppable on that day and had to be mercilessly killed by 7 warriors? There is a slight myth associated with Abhimanyu, that he learned the entry into Chakravyuh while he was conceived in the womb of Subhadra. That is true but not the entire truth. 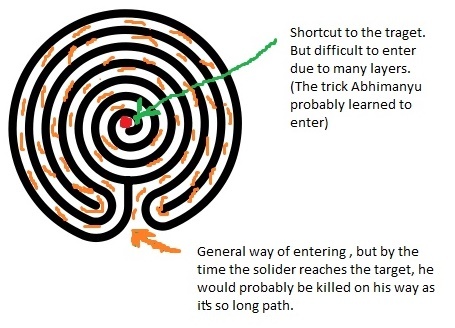 Abhimanyu learned the formation of Chakravyuh while he was in the womb, when Arjuna was telling Subhadra how Chakravyuh is formed, the characteristics, the gates, which Maharathi guards which gate, what happens when one gate falls and other things. However, the intricate details of entering and maneuvering inside Chakravyuha was taught to Abhimanyu by Krishna, not Arjuna. Arjuna was not at all aware that Abhimanyu knows this secret thing from Krishna. Krishna and Satyaki together trained Abhimanyu. Only five had complete knowledge of entering and cracking Chakravyuha – Drona, Aswathamma, Arjuna, Krishna and Pradyumna (son of Krishna and Rukmini). Drona had taught Arjuna how to enter Chakravyuha and crack it but it is Krishna who taught Abhimanyu a different approach of getting inside Chakravyuha, which even Arjuna did not knew. Abhimanyu would secretly practice it with Krishna and Pradyumna and this gives Abhimanyu an upper hand over Drona and Arjuna, the knowledge of a different way to attack a problem which the other player is not aware of. There are multiple ways of attacking a problem. Drona had taught Arjuna that one way of attack but not all ways. However, Drona is in complete dark that there is another guy in the enemy camp who not only knows his way through an indirect form, but also keeps a workaround in his kitty which he himself is not aware of. The Kaurava army is not prepared for Abhimanyu. They know that Arjuna is away and none in the Pandava camp can crack Chakravyuha. So Abhimanyu has achieved “Element of Surprise”, a vital edge in any battle where your enemy has no knowledge about your capacity and “Next move”. You can contrast this with Japanese invasion of Pearl Harbour wherein a small country attacks a behemoth and destroys the entire fleet just using “Element of Surprise”. Abhimanyu had speed and agility over other Kaurava warriors. The biggest advantage Abhimanyu had was his agile movement. He could do quick maneuvering in the battlefield, he learnt this trick from Krishna on how to control his chariot over a blazing army and find gaps within enemy formation. Krishna was a master charioteer and he trained Abhimanyu how to move swiftly but carefully, just like a rabbit. Abhimanyu was a Maharathi. A Maharathi is a warrior having mastery of all forms of weapons, battle formations and combat skills. Just like Drona, Arjuna, Karna and Bheesma, Abhimanyu was a Maharathi who could fight in equal terms on a one on one duel against any other Maharathi. Duryodhana was not a Maharathi, he was equivalent of 8 Rathis since his Archery skills were not at par. Kripacharya was not a Maharathi so he could not stop Abhimanyu as well. The only person in Kaurava camp who could have single handedly stopped Abhimanyu was Aswathamma. Aswathamma was considered equal to 12 Maharathis but there was a condition – he has to be extremely angry and excited to unleash his full potential. None of the Kaurava warriors except an Angry Aswathamma had an upper hand against Abhimanyu since he was a Maharathi, equal in skillset with that of Drona and Karna (the only Maharathis after Bheesma who fought against Abhimanyu). Now that this guy has entered the show, our plans are scattered. We don’t know his capacity, we haven’t planned for this move and we don’t know how he is going to play his stint. On top of this, we cannot linger the battle since Arjuna can return anytime and then the problems multiplies by many folds. Our sole goal is to capture Yudhisthira and we cannot risk losing time and resources in figuring out a problem we had not anticipated. Let’s just get rid of him by any means and focus on the target – Yudhisthira. Whether Abhimanyu lives or dies is not the concern, what concerns us is that Yudhisthira must be made captive before Arjuna returns. In this chaos and confusion, Duryodhana ordered his fleet to just jump on him and get rid of him. Whether Drona or Karna fights with him through fair means became secondary since the Kauravas were desperate enough not to lose the trump card – Forming Chakravyuha in the absense of Arjuna and Capturing Yudhisthira. It was combination of panic, surprise and loss of precious time that forced the Kaurava army to not think but execute their merciless plan. Abhimanyu simply did not give any of Kaurava maharathis time to regroup and would leisurely find gaps in the formation, cripple the movement and sabotage the functionality of Chakravyuha.